The famous ‘Elephant Gathering’ at Minneriya Park has become a regular phenomenon from June to about October each year, which coincides with the dry season in the North Central Province. The Minneriya tank fills up with the rains from the previous months, and as the drought settles in, the water level recedes, though the tank never really runs dry. Wild elephants from all the surrounding areas, from as far as Wasgamuwa, the Somawathi Sanctuary and Kantale thus congregate at the Minneriya Park due to the availability of water during the drought. The receding waters of the tank also leave behind rich, freshly sprouting grass, which is a favourite with the elephants. During the rainy season that begins around September/October each year, the reservoir fills up, and so do many other water holes and tanks in the area. 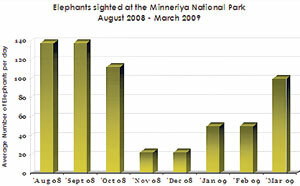 Having adequate water and food in the surrounding areas, the elephants then begin to move away from Minneriya. Hence the ‘Gathering’ is seen as a seasonal phenomenon at the Minneriya Park. This has been the case in the past years, where during the rainy season, one could see only about 10-20 elephants in the park, a far cry from the hundreds seen during the ‘Gathering’ in the dry season. However, like in many parts of Sri Lanka and the world, there has been considerable change in weather patterns over the past few years. This year in particular, the North Central Province seems to have received relatively less rain, although accurate figures are still unavailable from the Meteorology Department. 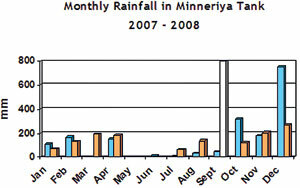 The available figures indicate that there was a drop of 62% and 64 % in the rainfall for the months of October and December 2008 respectively, compared to the corresponding months in 2007. Data for the month of September is not available, while November 08 shows a marginal increase over November 07. (See graph ). Consequently, the Minneriya tank has not filled up as much as it normally does and according to records maintained by Hotel Sigiriya, elephants have been sighted in increasing numbers in the park, from as early as March this year. Since alternate water holes and food sources have not re-generated due to the lack of rains, the elephants seem to have not moved too far from the Minneriya /Sigiriya area this year. In addition, there seems to have been a larger number of Human Elephant Conflict (HEC) incidents reported this year. Already there have been three recorded deaths of humans due to altercations with wild elephants within the last three months in the Sigiriya/ Habarana area alone. Elephants have been sighted often in the evenings and nights on most roads. Last week a mature male elephant was seen beside the main Dambulla – Polonnaruwa highway, nibbling at the foliage as early as 6 p.m. Recently the new Vil Uyana Boutique Hotel in Sigiriya was visited by wild elephants who had caused slight damage to the walkways. Certainly more careful observations and studies will have to be done before any firm conclusions can be arrived at. 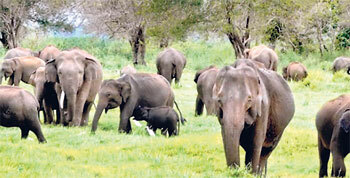 The Minneriya Gathering is probably the largest gathering of Asian Elephants in one and the same place. However, it is important that we guard against over-visitation of the Park. As it is, unregulated movements of jeeps in the open plains, not only disrupt the movement of elephants from the surrounding jungles to the water, but also damage the young sprouting grass. The Tourist Hotels Association of Sri Lanka (THASL) with the help of environmentalist and CEO of Jetwing Eco Holidays Gehan de Silva Wijeyeratne has conducted a few awareness programmes for jeep drivers of the area. The public who visit this park, also need to understand the delicate balance of this whole event, and ensure some form of self discipline themselves. Where good things do come cheap!